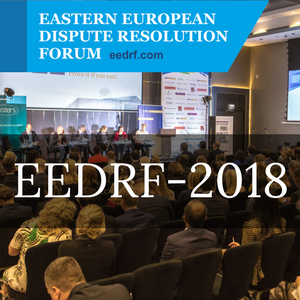 This autumn Minsk will host the annual Eastern European Dispute Resolution Forum (EEDRF-2018) for the third time. Lawyers from all over the world will unite for a few days in order to discuss key topics related to dispute resolution in international commercial arbitration and state courts at this year’s event, which this year is organized under the slogan “Know your expert!”. CIS Arbitration Forum, as previously, is an information partner of the event. The Eastern European Dispute Resolution Forum (EEDRF) will take place during 20-21 September 2018 at the Minsk Marriott Hotel (20 Pobediteley Avenue, Minsk). Minsk is ready and waiting to meet more than 200 lawyers at the EEDRF, which will include major players from the world of dispute resolution, including representatives of international law firms, corporate and in-house lawyers, experts in the field of litigation and arbitration from Central and Eastern Europe, the Baltic States, CIS, Western Europe and the United States, as well as, law students, members of the academic community and the public sector. The following heads of major European arbitral centers and institutions have already confirmed their participation: the Secretary General of the Arbitration Institute at the Stockholm Chamber of Commerce, the Secretary-General of the Vienna International Arbitral Centre, the Secretary-General of the Arbitration Institute of the Finland Chamber of Commerce and others. September 21 – The Eastern European Dispute Resolution Forum will take place, where more than 20 speakers – all of which are highly qualified specialists in different jurisdictions from Austria, Czech Republic, Ukraine, Finland, USA, England, France, Lithuania, and other countries – will participate and share their experience concerning the topics of the Forum. LOUIS FLANNERY QC is head of International Arbitration at Stephenson Harwood LLP in London. He specializes in arbitration and litigation with a particular emphasis on fraud and/or conflict law issues. Louis is a regular speaker on arbitration and civil fraud at conferences all over the world. He has extensive experience of international commercial arbitration under all of the major institutional rules (AAA, ICC, LCIA, UNCITRAL, SCC, and many others) as well as substantial High Court litigation in England. Louis was named as a leading international arbitration practitioner in “Who’s Who Legal: Arbitration Lawyers 2018”. As a practicing solicitor advocate, he has undertaken advocacy before international tribunals and courts, including the High Court and Court of Appeal. Louis has acted or advised in relation to commercial disputes for over 25 years and has been involved in many reported decisions in England. The Eastern European Dispute Resolution Forum (EEDRF) is organized and supported by leading law firms specializing in dispute resolution, as well as by the Russian Arbitration Association, the Ukrainian Arbitration Association and the International Law and Arbitration Association(BILA). The organizing partner of the Forum is SBH Law office. The Co-chairman of the Forum Organizing Committee, advocate, and partner at SBH Law office, Alexandre Khrapoutski, notes that the distinctive feature of the Forum is its exceptional practical focus. “The Forum is a unique platform for Eastern European countries, it has no equals. It is unique as it has been created by lawyers for lawyers. The principal idea of the Forum is to acquaint lawyers with dispute resolution mechanisms and techniques in Eastern European countries, inform the lawyers about peculiarities of interpretation of legislation in various courts. Now, since the Forum first started taking place, Minsk has an opportunity to offer the entire legal community to join a lively and interesting platform for serious discussions of topical questions. Being the organizing partners of the Event, we intend to raise the most burning questions, which will generate the interest of members of the professional community and will be widely covered by the world media. To achieve this, we are willing to invite the best speakers who are among the most well known, highly-respected and highly-regarded lawyers of the world”. During both 2016 and 2017, the Forum proved to be a huge success and has already established itself as a must-attend event and an excellent platform for communication between practitioners specializing in dispute resolution. Осенью в Минске уже в третий раз пройдет Форум по разрешению споров стран Восточной Европы (EEDRF). Международный формат мероприятия на несколько дней объединит юристов со всего мира под одним лозунгом «Знай своего эксперта!». 20 сентября – Пражские правила, Мастер-класс от Партнера и Специальная культурная программа «Открой для себя Минск: у каждой улицы своя история». 21 сентября – Основной день Форума по разрешению споров стран Восточной Европы, где более 20 спикеров – высококвалифицированные специалисты в разных юрисдикциях из Австрии, Чехии, Украины, Финляндии, США, Англии, Франции, Литвы и других стран – будут участвовать и делиться своим опытом по теме Форума. 22 сентября – Уникальное путешествие от партнера Форума. Луи Фланнери, QC является главой практики международного арбитража в юридической фирме Stephenson Harwood. Он специализируется на арбитражных и судебных разбирательствах, уделяя особое внимание вопросам мошенничества и коллизионного права. Луи часто выступает по вопросам арбитража и гражданского мошенничества на конференциях по всему миру. Он имеет обширный опыт в международном коммерческом арбитраже по регламентам основных институтов (Американской Арбитражной Ассоциации, Международной торговой палаты, Лондонского международного арбитражного суда, Регламента ЮНСИТРАЛ, Торгово-промышленной палаты Стокгольма и др. ), а также опыт участия в судебных разбирательствах в Высоком суде Великобритании. Луи был назначен ведущим международным арбитражным практиком в «Who’s Who Legal: Arbitration Lawyers 2018». Будучи практикующим адвокатом-солиситором, он занимался адвокатской деятельностью в международных трибуналах и судах, включая Высокий суд и Апелляционный суд. Луи консультировал по вопросам разрешения коммерческих споров на протяжении более 25 лет и принимал участие во многих принятых в Англии решениях.